The 43rd Annual Boulder Mountain Handmade Market is happening this weekend, November 11 – 12, 2017 from 10AM – 4PM at Boulder Elks Lodge in North Boulder. The market brings together over 60 artisans, as well as an amazing bake sale, FREE all-ages maker area, live music and fire truck tours. 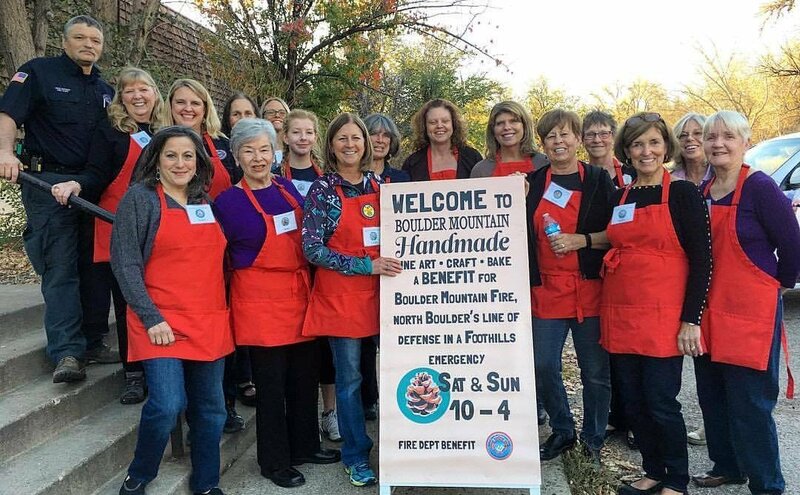 Boulder Mountain Handmade is a fundraiser for Boulder Mountain Fire Protection District Auxiliary, North Boulder’s line of defense in a foothills emergency. Admission to the market is FREE. The Boulder Mountain Handmade Market brings together over 60 local artisans and their unique arts and crafts. You’ll find everything from jewelry, candles and paintings to woodworking, photography, fiber arts and so much more! For a full list of this year’s artisans, click here. Stop by the Boulder Mountain Creates area, featuring handcrafted gifts made by members of BMFPD Auxiliary and foothills residents — 100% proceeds from these sales go to support the work of BMFPD volunteer firefighters. Boulder Mountain Fire Protection District residents create scrumptious baked goods from scratch to bring you Boulder’s Best Bake Sale! You can expect bakery tables to be piled high with their work – cookies and bars, pies and breads, and so much more. Adults and kids are cordially welcome to spend some time with Bohemia – An Artful Space, hosts of Boulder Mountain Handmade’s all-ages free maker space. Spend a little time making something beautiful, go home with a gift you made yourself! Pick up info about studio offerings and private party options that Bohemia offers. They’ll be welcoming crafters from 10:30 am until 3:30 pm Saturday and Sunday. Entertainment in the Elks Lodge cafe area includes a capella, rock, and classical performances, all graciously donated by the performers. Featuring Old’s Cool Rock, The Hoppers, Holly and Lindey, 3 Story Limit, Scott Kaufman, and Beth & Gus Cooke. Elks Lodge offers light snacks and drinks in the cafe. The Buffs game on Saturday will be viewable there, closed-captioned. The ATM is also located in the Elks cafe. Volunteer firefighters will be on hand to give Boulder Mountain fire engine tours to kids and adults. Firefighters will be giving away free plastic fire hats and activity bags. The Boulder Mountain Handmade Market will take place this weekend, November 11 – 12, 2017 at Boulder Elks Lodge. For further information, visit: http://www.bouldermountainhandmade.com/.